Happy FRIDAY!! WhooHoo Friday Baby!! Anyone else this excited for the weekend? It is 9am and I already have our back screen door open, and the fresh warm air coming in. I wanted to share a book recommendation with ya today and I just couldn’t wait till next week to share it! These past few months have been great reading months for me! Each book has had me hooked from the beginning all the way through to the end. I’ll have a post on Monday for ya with all of my latest and favorite reads. The book I just finished, Reconstructing Amelia, was just amazing! It is one of those books that I found at the bottom of my to-read stacks, and I’m pretty sure I’ve owned it for over a year now. I know that is sad, but my to-read stacks are getting out of control, and I’m very proud of my book buy addiction. Reconstructing Amelia was a tragic story that pertains to the world our children live in today. It also deals with the issues parents face when communicating (or not communicating) with their children, how far a parent should trust their teenager, and where a parent should intrude on their child’s privacy. All are issues that I know parents with teenagers face. Especially the issue of following your child’s actions on the internet like a hawk. I know I’ll follow all my child’s internet actions until the day he moves out (he isn’t allowed to even get on Facebook until he is 16…or maybe 20…I’m not sure yet). In Reconstructing Amelia, the stunning debut novel from Kimberly McCreight, Kate’s in the middle of the biggest meeting of her career when she gets the telephone call from Grace Hall, her daughter’s exclusive private school in Park Slope, Brooklyn. Amelia has been suspended, effective immediately, and Kate must come get her daughter—now. But Kate’s stress over leaving work quickly turns to panic when she arrives at the school and finds it surrounded by police officers, fire trucks, and an ambulance. By then it’s already too late for Amelia. And for Kate. 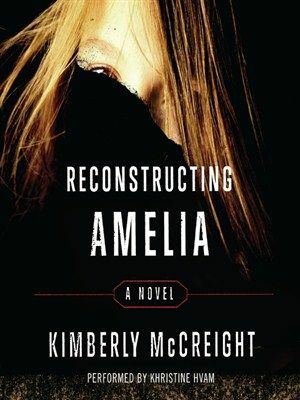 Once I finished Reconstructing Amelia, I immediately went on Amazon to see if the author, Kimberly McCreight, had any other books publish. Guess what? McCreight just published a new novel, Where They Found Her, on Tuesday, April 15th! What kind of incredible luck do I have!?! Usually I’m pacing and waiting for an authors next book to come out. Of course, I just ordered it, and I cannot wait to read it! There is more…They are making Reconstructing Amelia into a movie staring Nichole Kidman!! I’m actually going to go see this book turned movie too. I usually avoid books that have been turned into movies. Nine times out of ten, I walk out of the theater thoroughly disappointed or pissed off at what they did to the story. However, with this story I’m really intrigued to see how the movie comes out. This entry was posted in Books, Spinning Profiles, Workouts and tagged books to read, cycling playlist, indoor cycling, kimberly mccreight, reconstructing amelia, spin profile, spin ride, spinning playlist, where they found her on April 17, 2015 by fromfltond.